I ran to my favorite thrift store last week and found this lamp shade for $2. It thought it would be perfect for my daughter’s room, but it was pretty darn big, so the only place it would really fit would be on her ceiling fan. So, why not?! and her light after the $2 shade was added. She actually squealed when she got home from school! I’m sure there’s a proper way to do this, but I just removed the glass shades and used some craft wire to attach it. I wrapped the wire around the screws that had been holding the glass shades in. Then I twisted the wire in the middle to feed it through the center of the shade and secure it. Pay no attention to the fact that there are 3 different light bulbs. It’s been up for 2 days with the fan going and it hasn’t budged an inch! We are totally in love with it! It’s the first thing you see when you walk in her room and it totally changes the look of it! I love it! 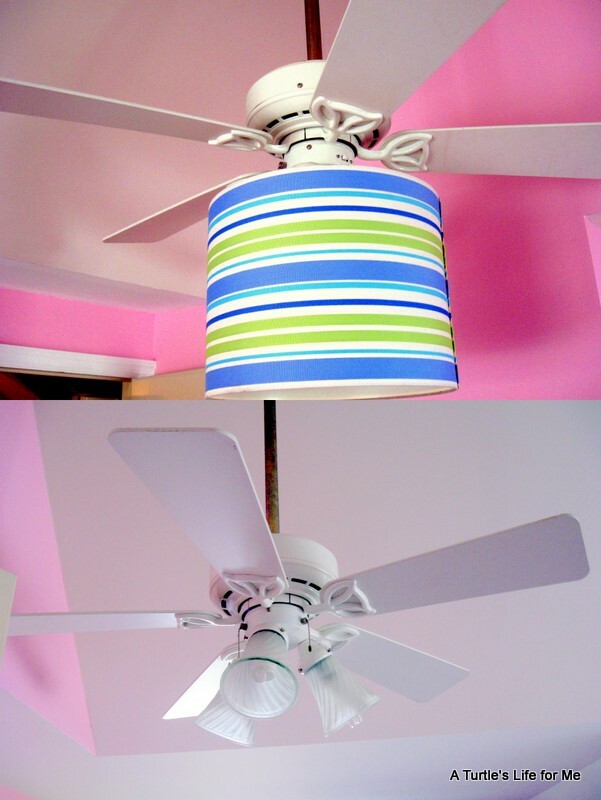 It’s hard to think of things to make ceiling fans look awesome but this does! Ok, so this is one of those trends that I haven’t fallen in love with…but I have to admit, that is pretty darn cute…love the stripes!! And the $2 price tag…awesome! So clever! I don’t really love ceiling fans all that much, mostly because the lights on them are usually not very pretty. This is the perfect solution! AHHH! I love this idea. I hate our tacky lights on our ceiling fan and think I’m going to take your advice and revamp ours ceiling fan! I just pinned this to my pinterest board and am your newest follower! Great stuff! Loved it!! What an amazing idea! $2! Fantastic! I love the look, I can see why she squealed. Love this too! I know exactly what light I would do this on! Thanks for sharing! Fantastic update to your daughters fan! Can you post a picture looking up into the light? I am wanting to incorporate your idea with a ceiling fan in my living room but it is on a high ceiling so what it looks like from underneath is just as important as from all other angles.